Apple’s iPhone 6 will come with a cutout logo on the rear cover, according to a leaked photo posted by Macfixit. 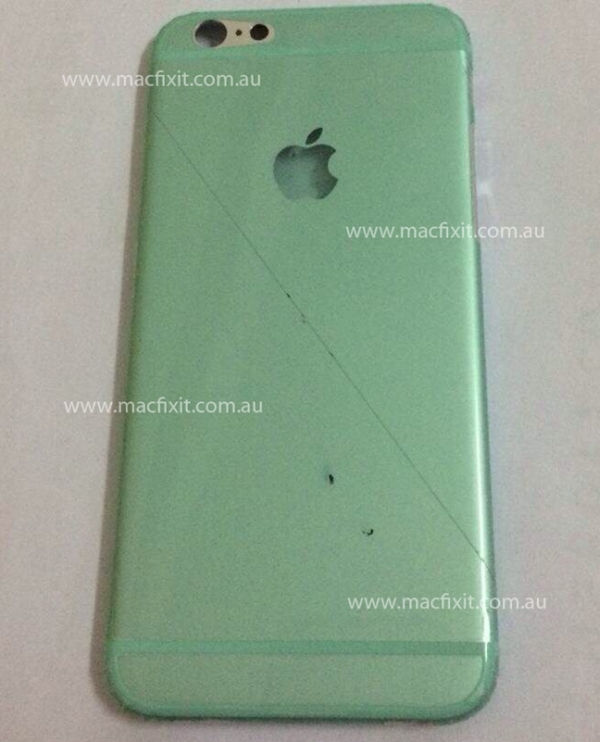 The Australian blog got the photo of the 4.7 inch model from a reliable Chinese source, and it shows the alleged green shell of the phone with the Apple logo. After many months of rumors and speculations regarding iPhone 6’s future specs, a new leaked photo hit the Internet. The Australian blog Macfixit claims to have received a photo of the 4.7-inch Iphone 6’s back cover, which seems to have a cutout in the shape of Apple’s logo. The dummy model’s back isn’t made of plastic, as it may appear because of its green color, because it’s only a coat that covers the silver aluminum rear cover. The shells’ round corners remind us of the iPod Touch’s design. Other devices with more pronounced round corners are the iPad Air and the iPad Mini, which proves the fact that Apple is continuing the tradition. This, if we’re supposing that the leaked photo of the alleged iPhone 6 is authentic and it contains the real future back cover of the device. This would be an exclusive image of the upcoming iPhone 6’s back with an Apple cutout logo. We’ve seen many mockups so far, but this one shows a green cover with cutouts for the antenna, camera and flash and there’s a portion uncovered by the green film which indicates that the real shade of the dummy iPhone 6 model is silver. At first, it was speculated that the iPhone 6 will have an illumination module and not a polished logo. In the end, Apple opted for a metal piece which is supposed to be used as a radio-transparent window, just like in the case of the iPad Air. Other speculations regarding the iPhone 6’s features: a better A8 processor, 802.11ac Wi-Fi, new backlighting technology and also a better primary camera that will come with optical image stabilization. The iPhone is at this time the most expected smartphone from Apple and if the device will come with a cutout logo on the back will surely be more attractive. We’ll see if in the near future we’ll have more leaked photos of the phone. Will iPhone 4 and iPad 2 get the new iOS 8?